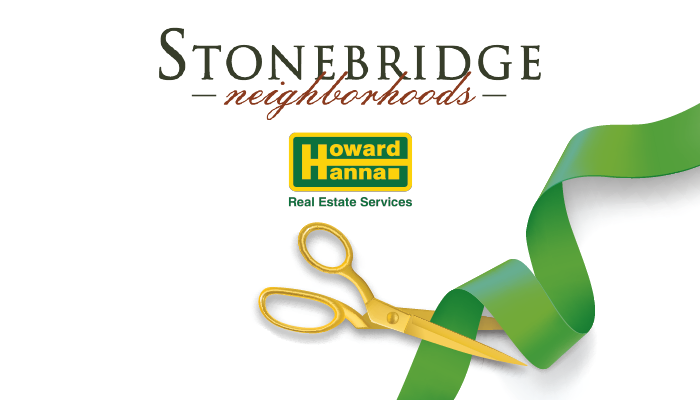 Canfield, OH (March 29, 2019) – Stonebridge Neighborhoods and Howard Hanna Real Estate Services will hold a ribbon cutting ceremony today at 4:00pm at one of the new model homes located at 241 Saybrook Drive. Saybrook Pointe is a blossoming villa community. Villas on the east side of the development overlook two serene lakes and offer maintenance-free living with the possibility of a walk-out basement. Westbury Park features carriage homes that are smaller and easier to maintain in addition to traditional-style homes ranging from 1,900 square feet to more than 5,000. Stonebridge is a well-stablished development with homes ranging from 1,900 square feet to well over 3,000. The Mill Creek MetroParks Bikeway is located within a short walking distance. There are four model homes built and available to tour during the Grand Opening Weekend, Saturday, March 30 and Sunday, March 31, 2019, from 12-4pm. Brownstone Construction is the featured builder at Stonebridge Neighborhoods. For more information, please contact Site Coordinator Breanna Fitzgerald at 330-717-4001. About Howard Hanna: Howard Hanna Real Estate Services is the 3rd largest real estate company in the United States, the #1 privately owned broker in the nation, and the largest home seller in Ohio, Pennsylvania, Ohio, and New York. The family-owned and operated real estate company specializes in residential and commercial brokerage service, mortgages, closing and title insurance, land development, appraisal services, property and casualty, corporate relocation, and property management. With 312 offices across OH, PA, NY, VA, MI, WV, MD, and the Carolinas, more than 11,000 sales associates and staff are guided by a spirit of integrity in all aspects of the real estate process. For more information, visit www.howardhanna.com, or www.facebook.com/howardhanna.